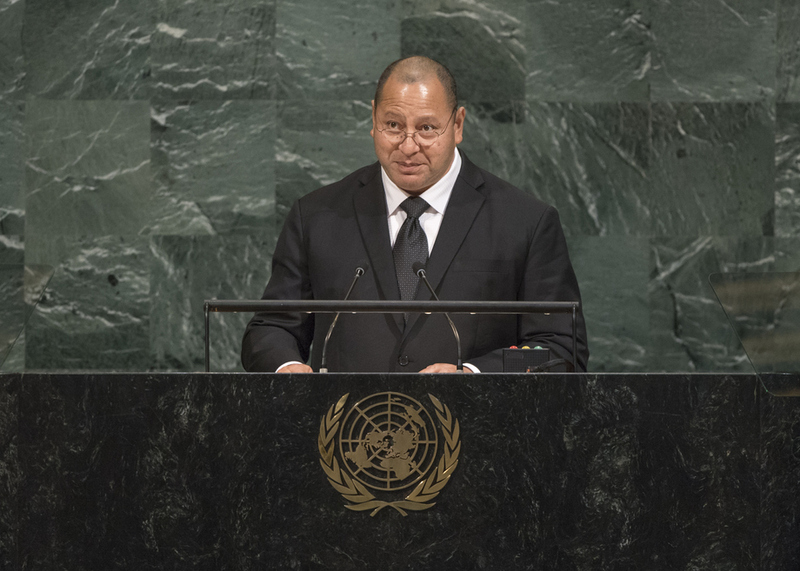 TUPOU VI, King of Tonga, expressing his solidarity and sympathy to the people of Mexico and the Caribbean, reiterated his call for the appointment of a Special Representative on climate and security. It was imperative for the United Nations to develop the appropriate tools to respond to climate change. International organizations like the IMF (International Monetary Fund) and World Bank had made strides to better finance disaster relief in small island nations, he said. Still, a broader definition of “fragility” was needed to ensure preparedness against natural and economic shocks. Tonga had established a national monitoring mechanism to oversee progress related to achieving the goals of the 2030 Agenda. Close ties between Tonga and the United Nations were ensuring progress towards achieving the Sustainable Development Goals. Tonga was working closely with other small island States to achieve Goal 3 on good health and well-being, Goal 5 on gender equality and Goal 14 on the ocean and its resources. Ocean degradation was particularly alarming, he said, as all small island nations were in fact “large ocean States”. Achieving Goal 14 was critical to creating pathways towards sustainable development. Issues from food security to economic growth required a whole-of-government approach, he said. Durable partnerships, he assured, were the way towards development that left no one behind. A key aspect of those partnerships was gender parity. Tonga expressed its full support for the inclusion of women at all levels of the United Nations and welcomed the appointment of the first woman from his nation and the Pacific island region as High Representative for the Least Developed Countries, Landlocked Developing Countries and Small Island Developing States. Meeting current and future challenges required accessibility to sustainable energy, he said. Mitigation efforts had to be targeted at overcoming the current dependence of imported fossil fuels. A centre for renewable energy and energy efficiency was established in Tonga to assist Pacific island countries and territories towards achieving sustainable energy, he said. Sustainable development was only possible in an environment of peace and security, he continued, calling on all Member States to reflect on how their power and legitimacy could benefit their people and the world. Current tensions were derailing those goals, he said, appealing for a speedy resolution to the security crisis in the Korean Peninsula that was affecting global peace and security.